When artist Daan Roosegaarde visited Beijing in 2014, he was inspired by what he didn't see. From his hotel room on the 32nd floor, his view of the sprawling Chinese capital was totally obscured by smog. "It was all gone," Roosegaarde says. "The city was completely covered with smog." Two years later, he is taking the world's largest air purifier on a tour of China. 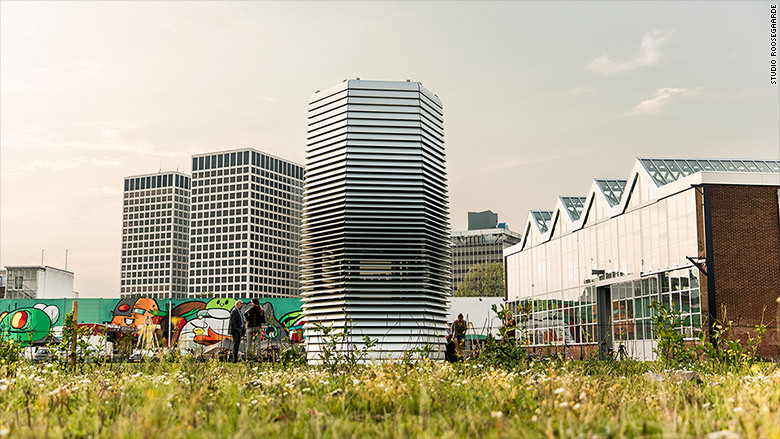 The Smog Free Tower will create bubbles of clean air in inner-city parks and, Roosegaarde hopes, raise awareness of the dangers of air pollution. The tower has just had a pilot run in Roosegaarde's hometown of Rotterdam, where his company, Studio Roosegaarde, is headquartered. It had a surprising effect on the local environment. "For some reason, little rabbits find the space around the tower particularly intriguing. I don't know why. Perhaps they can feel the difference," he says. Using ion technology, the tower attracts and captures the small pollution particles -- PM2.5 and PM10 -- and releases clean air, leaving the surrounding area with air that is about 75% cleaner, Roosegaarde says. "Basically, it's like when you have a plastic balloon, and you polish it with your hand, it becomes static, electrically charged, and it attracts your hair." The seven-meter high tower can clean around 30,000 cubic meters of air each hour, which Roosegaarde says is "a small neighborhood a day." It runs on just 1,400 watts of power -- no more than a tea kettle. The tower will arrive in China in September, starting with Beijing. The tour, a collaboration between Studio Roosegaarde and China's Ministry of Environmental Protection, will decide its subsequent city stops in China based on the results of a public online vote. After China, Roosegaarde plans to bring the tower around the world -- Mexico City and India are destinations under consideration. More than 80% of people in urban areas are exposed to air quality levels that exceed World Health Organization limits. As urban air quality declines, the risk of diseases such as strokes, heart disease, lung cancer, and asthma goes up. Small particles, PM10 and PM2.5, are particularly dangerous and affect more people than any other pollutant. The smaller the particle, the more dangerous it is -- PM2.5 being so tiny it can easily penetrate the blood and lungs. While all regions of the world are affected, populations in low-income cities are the most impacted, with 98% of cities there not meeting WHO air quality guidelines, compared to 56% of cities in high-income countries, according to recently released data from WHO. Roosegaarde says he has had requests from all over the world to make more towers, but cautions that it is not a miracle solution for improving air quality. "But I believe that creating a place where people can live, where they can feel the difference, smell the difference -- that is a very powerful motivator." For him, it's more about drawing attention to the problem. "I hope that the designs I make will be part of a mentality change," says Roosegaarde. 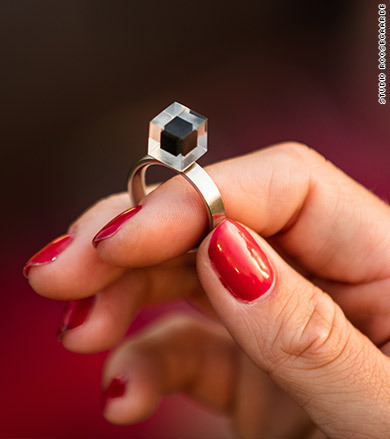 The tower doesn't just clean the air -- Roosegaarde's team also uses the smog it collects to make jewelry. The inspiration came from how diamonds are made in nature by compressed carbon. 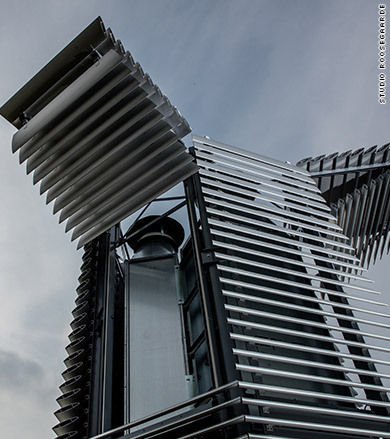 The tower collects compressed smog particles, which are partially made of carbon. They're put under high pressure for 30 minutes, sealed within a resin cube, and used in rings and cufflinks. "We have wedding couples buying it," Roosegaarde says. "They want to give each other true beauty." The first 1,000 rings and cufflinks have been shipped and people are asking for more. 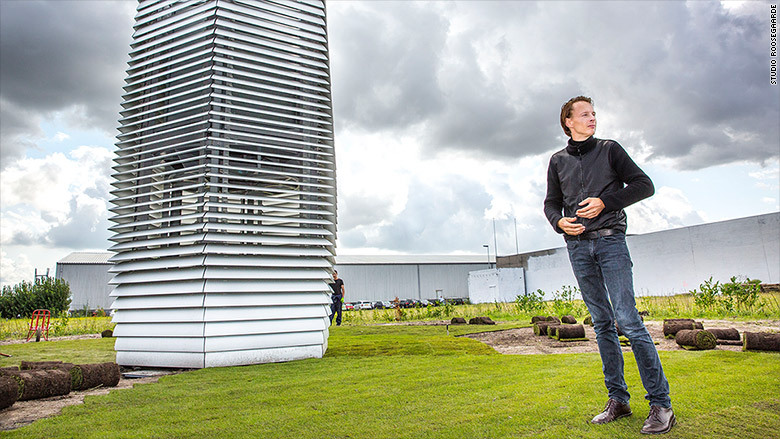 There is only one problem -- they have already run out of smog, Roosegaarde says. "But I am sure in Beijing we will catch up." The 36-year old designer founded his company Studio Roosegaarde in 2007 -- and calls it "the dream factory." Roosegaarde's other projects have included a Van Gogh inspired bicycle path run by solar-powered paint, and a dancefloor that generates electricity as people move. He says he has always sought inspiration from his environment. "I am a guy who fell in love with places before I fell in love with girls. I always had a really strong connection with making places and experiences that you cannot download," says the designer. "And in a weird but beautiful way I became inspired by the Beijing smog."